compatible with LiftMaster® 300 series products. 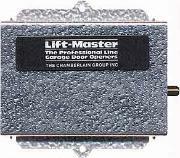 Liftmaster 315mhz frequency receiver for liftmaster garage door opener or gate operations. Works with 2005 and later models. Momentary or constant contact, jumper selectable. Will work with ALL Lift-Master, Sears or Chamberlain remotes as described above.